I don’t know many people who don’t like waffles. But if you’re making your waffles from pancake batter, you’re missing out. 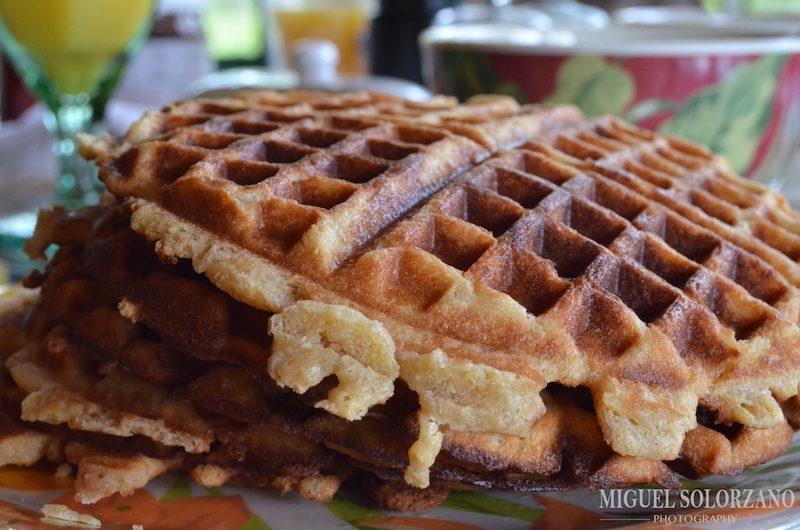 Liège Waffles use yeast in the batter as well as pearl sugar to give them a nice texture. This waffles are crisp, yeasty, fluffy and crunchy. In a small bowl, whisk together water, brown sugar and yeast. Let stand about 5 minutes. In a large bowl, mix flour and salt. Create a well and pour in yeast mixture. Mix together all ingredients until a lumpy batter begins to form. Add the eggs (one at a time) and keep mixing to produce a batter. Mix in the vanilla and melted butter gradually until smooth. The batter should be thick. Cover the bowl with a damp rag (or plastic wrap) and let sit for 2 hours or overnight. Stir the pearl sugar into the risen batter. Cover again and let rest for 15 minutes. Preheat oven to 200F. Also preheat your waffle iron to medium-high. Brush the waffle iron with melted butter (you can also use non-stick cooking spray). Use two heaping tablespoons of the batter for each waffle, cooking until golden-brown and crisp. Transfer the waffles to a plate and keep warm in oven until ready to serve. These waffles do take some time in the preparation department, but they’re worth it. They’ll wow breakfast guests. Pearl sugar may be difficult to find in your local grocery store so I recommend heading over to Amazon.com. If you don’t want to buy pear sugar, you can coarsely chop up some sugar cubes as a substitute. I am not a big waffles or pancake man, I have to get a craving for either to make them. “Po’ Boy Livin” Rich” is correct, pancake batter is NOT for making good waffles, they make good pancakes. Try this recipe the next time you get a craving for waffles. Looks yummy! I wished I had a waffle maker! Don’t feel bad. I had to use a friend’s, but after having these, I may invest in one of my own. Holy moly…two sticks of butter? That’s as rich as cake batter. Guess you don’t need to put butter AND syrup on the finished product. You’re correct. I did not put butter or syrup on them. I used Nutella, strawberries and/or a homemade salted caramel. Ok…the last topping has more butter and sugar, maybe that’s why it was the best.